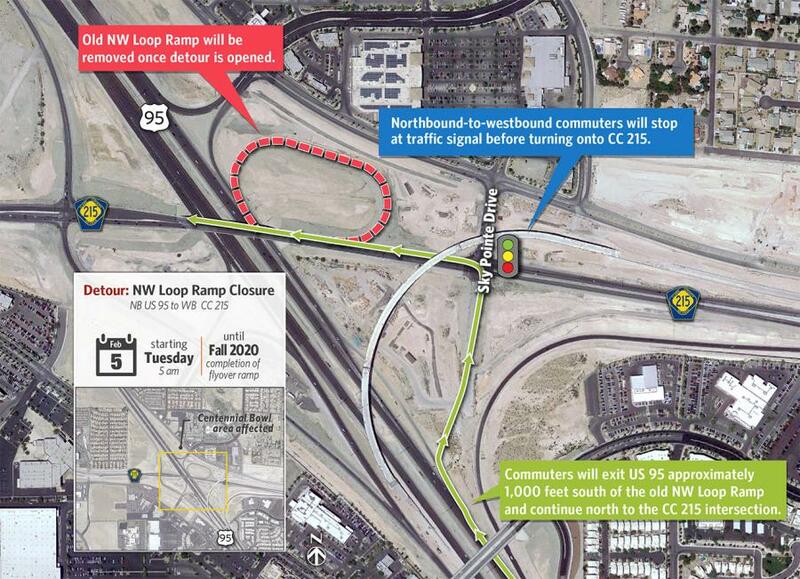 The Nevada Department of Transportation (NDOT) permanently closed the northbound U.S. Highway 95 to westbound 215 Beltway loop ramp Feb. 5, in northwest Las Vegas. It's being demolished and rebuilt as a direct flyover ramp as part of the $73 million next phase of the Centennial Bowl, which broke ground in January. Las Vegas Paving is the general contractor. The 75-ft.-tall by 39-ft.-wide concrete box girder structure will measure 2,635 ft. or the equivalent of seven football fields. The two-lane flyover bridge will connect north-to-west traffic, enabling direct freeway-to-freeway connections while still maintaining highway travel speeds for greater efficiency and safety. It will be the state's second longest bridge. Meanwhile, alternate north-to-west freeway access will be clearly marked 1,000 ft. south of the old ramp. The detour will remain in place until construction of the new flyover bridge is complete in the fall of 2020. For more information, visit nevadadot.com.